Colorectal cancer possesses the third highest diagnostic rate and is the second leading cause of cancer death in the USA as reported by NIH. Epidermal Growth Factor Receptor (EGFR), a transmembrane protein, participates in PLC gamma-1, RAS-RAF-MEK-MAPKs, phosphatidylinositol-3 kinase, Akt pathways and plays a key role in normal functioning of cell division, cell differentiation, apoptosis and migration. This protein is found to be overexpressed in more than 60% of the colorectal cancers. Overexpressed EGFR advances the tumorigenic properties through cell cycle dysregulation and activates signaling pathways linked to cancer such as WNT/β-catenin, transforming growth factor β (TGF-β) and phosphoinositide-3-kinase (PI3K). Inhibiting the overexpressed EGFR protein has been proposed for the treatment and many inhibitors have been reported suppressing the activity of EGFR. However, patients in malignant state of cancer show resistance to those inhibitors, which open a wide space to research for the discovery of novel inhibitors. 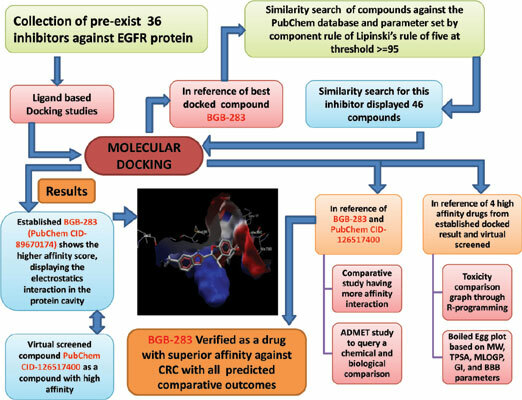 The present study employed Molecular Docking and Virtual Screening to find novel inhibitors with high affinity against EGFR. Molecular docking of existing inhibitors resulted in the compound titled as BGB-283 (PubChem CID-89670174) having the highest score, which was subjected to similarity search to retrieve the drugs with similar structure. The virtual screening concluded a compound SCHEMBL18435602 (PubChem CID-126517400) which revealed a better affinity with the target protein. A comparative study of both the compounds showed equivalent pharmacokinetic properties. These identified drugs have a high potential to act as EGFR inhibitors and can show promising results in the research of colorectal cancer. Colorectal cancer, EGFR, ADMET, Virtual screening, Molecular docking, APC.